Regardless of the trends in the market, the reliability of C&F Quadrant remains a constant – and that is reflected in the company’s involvement in the burgeoning hotel sector in Belfast. 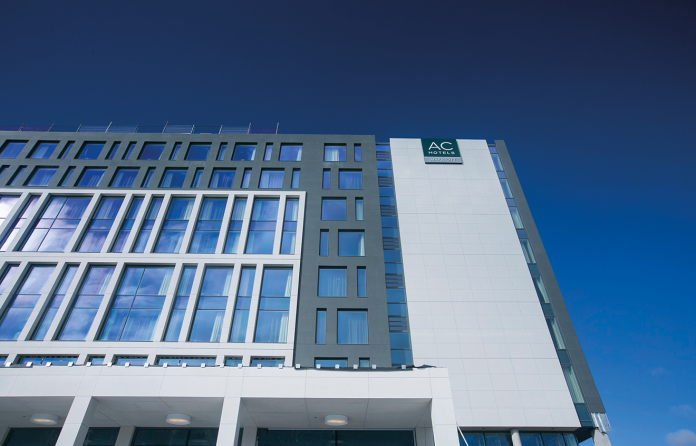 The latest hotel project that C&F Quadrant has been involved in is the new AC Hotel Belfast. Located in the heart of Belfast Harbour’s prime City Quays area, the contemporary-luxe, four-star hotel is the first Marriott in Northern Ireland and the first AC Hotels by Marriott on the island of Ireland. With 188 rooms, alongside restaurant, bar/lounge and meeting rooms, it is among the largest hotels in Belfast and C&F Quadrant supplied new ACV Heatmaster TC water heaters and ACV Prestige boilers to ensure the hot water and heating requirements of guests and staff are effectively met. 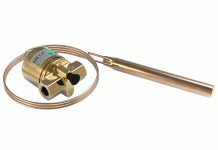 With a 10-year warranty on the stainless steel heat exchanger and providing efficiencies up to 99% condensing in heating and hot water mode, this combination unit delivers heating and DHW or DHW only. From an installation perspective, the space saving physical footprint of 0.52m2, rear flue options, suitability for cascade installation and the option of a flue run up to 65m makes it perfect for projects such as the AC Hotel. 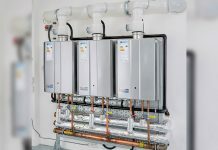 The heating demands at the hotel are being met by the ACV Prestige Cascade System – a high efficiency stainless steel wall mounted gas boiler that offers quality and cost efficiency. 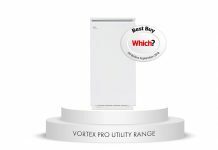 The boiler’s integrated Cascade Control minimises set-up time and, with a maximum turndown ratio of 18 to 1, the system provides ample output during peak demands yet adjusts its output during lower demands to minimise boiler cycling and maximise efficiency. C&F Quadrant worked closely with M&E contractor, Harvey Group, on the project as well as M&E consultants, ISD. “We specify ACV products all the time, quite simply because they never let you down,” explained Stephen Lynch, Managing Director, ISD.